The Camino brought some surprises on the last day. I expected most of the walk to be through the Santiago de Compostela suburbs but instead found myself on some narrow roads winding up and down through classic Galician villages including A Ponte Maceira, a town divided by a swift river crossed by an arched Roman bridge. I’ll miss the narrow stone streets twisting between houses, barns, and stables, all built to last centuries and showing through marks, additions, and gardens the history of the lives within. I’ll also miss those many villages circling their church tower and so clearly home to the people living there. The other surprise the way brought were old friends. First Elena and Michele, two peregrinos from Italy I had met early on my trek only to re-encounter them on the very last day. On saying goodbye to them, I immediately bumped into another early fellow hiker, a man from Germany who I had walked with the first four days. He had hurt his knee but after some rest had finished his Camino and was on his way to Finisterre. I usually tend to walk alone (as is clear in the earlier months of this blog), but the many peregrinos I was fortunate to spend time with made this a much different kind of trek. Although conversations were often limited by language(s), clearly communication took place. For that and the friends I made, I remain grateful. Today I kept telling myself that this was the last good long day through the Galician countryside (tomorrow is just 22 km into Santiago, much of that suburb street walking). It was a day of farms. The farmers are plowing and planting feverishly. I regularly stepped off the path to let the tractors pass. Much of the day was road walking though often the path would plunge into the woods a bit, and there remains the riot of wildflowers that is the Galician spring. A poignant moment came when my friend Patrick and I crossed paths. 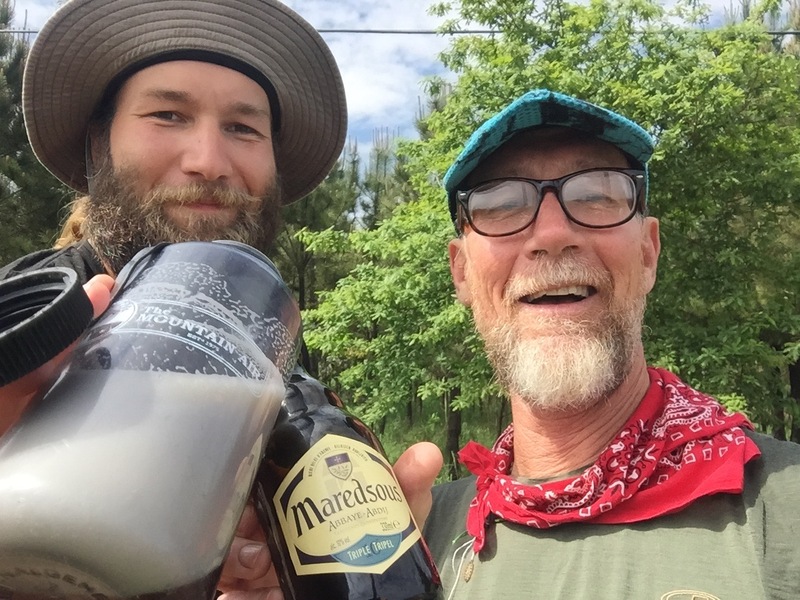 We had parted in Pamplona but met back up on today’s path, stopping for pictures, then Patrick produced a bottle of excellent Belgian beer which we split, toasting a good Camino friendship. Today’s path ended in Negreira, a forgettable town that had room in the Albergue but not much more. Tomorrow in Santiago my Camino ends. My image of the end of the world invariably includes fog, so this morning’s walk out to the Finisterre lighthouse lived up to expectations. The path makes its way up out of the town onto the spine of the ridge that eventually runs down into the sea. Fishing boats were coming across the smooth water of the bay, just within the halo of mist, and once the ridge narrowed I could also see the Atlantic, the opposite of smooth. At the end a building loomed–an old hotel just above the point where the famous lighthouse is stationed. Circling down I came to the blackened stone cross, apparently the scene of bonfires, but also a place that accumulates tokens of the peregrino’s peregrinations: thriller novels, stones, flip-flops, medals, sodden photographs– all a study in human fetishism. My jaunt to the point added 5 km to an already long hiking day, so after a quick and not very satisfying breakfast, I began the long circle along the bay before turning to head inland. Another beautiful hiking day with waves crashing on my right and woodlands full of wildflowers on my left. The path would descend to sea level, then over ridges to the next bay and village. Unlike the primary route of the Camino, this part has fewer villages with cafes, so I carried bread and chorizo to eat while walking. Oddly enough, after all these months of hiking, my feet decided to act up a bit, raising a couple of blisters like a newbie. Walking always brings with it novelty. Late afternoon I arrived at Logoso only to discover the Albergue full. 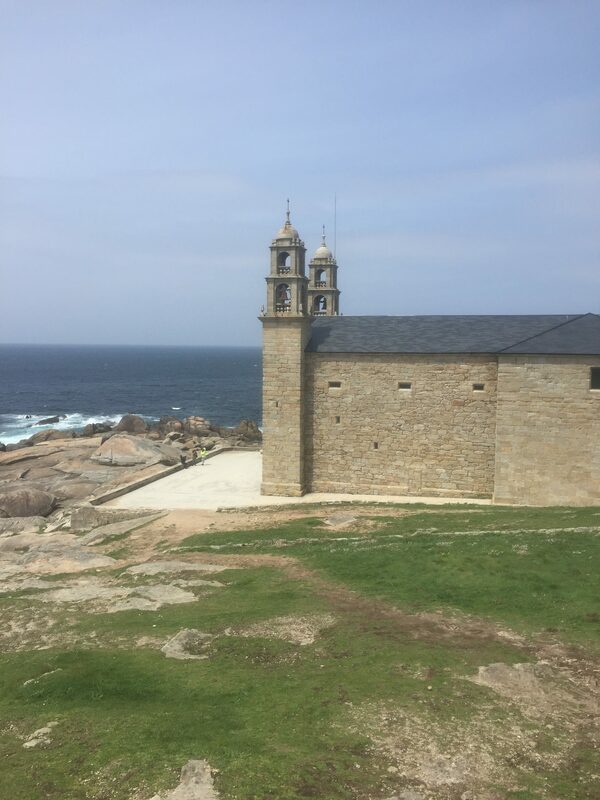 It seems that many of the short-time peregrinos, those who just do the obligatory 100 km prior to Santiago, continue on to Finisterre, so lodging is a problem. The owner of the Albergue drove me to his sister’s pension where I had my own room and an excellent pilgrims menu, a satisfying end to a physically hard day. After a week of living the life of a tourist–Santiago to A Coruna to Muxia–I once again strapped on my backpack–now solo–and resumed my trek around the world. Today it was from one “end of the world” to the next. 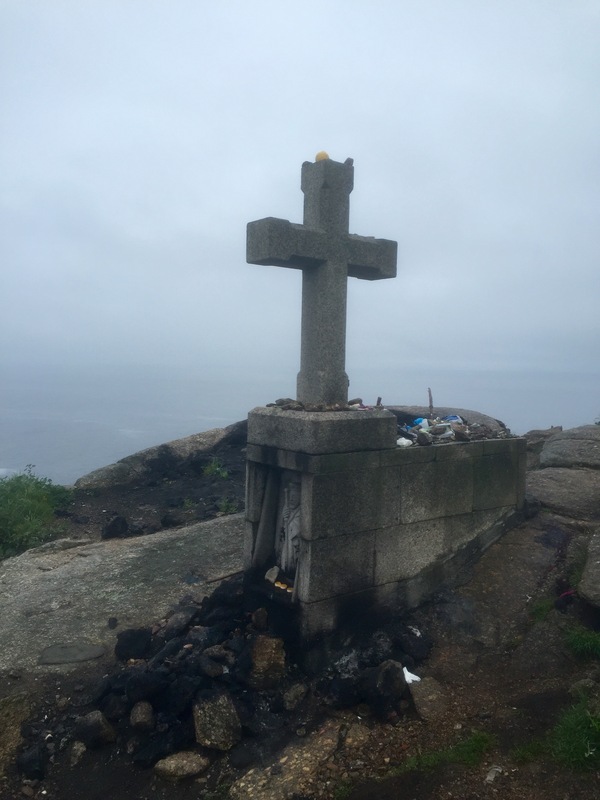 30 km from Muxia to Finisterre, the longstanding end of the ancient Camino, a trip not to St. James, but to the edge of the earth. My legs were clearly fresh as I walked the full 30km non-stop. Not that I was planning to do that, it is just that now, being off the Camino proper, villages with cafes are scarce. I would have been happy to eat a bocadillo and drink a pint at the midpoint, but no opportunity presented. Instead I was treated with a beautiful walk up and down a series of ridges, regularly glimpsing the ocean to the west, but more often surrounded by stalks of just-blooming foxglove and purple/blue columbine. My feet were light and the trail well-made. I encountered many peregrinos making their way from Finisterre to Muxia (the more traditional route), and encountered a few going my direction, but surprisingly, I had much of the trail to myself, a great opportunity for much needed quiet contemplation. 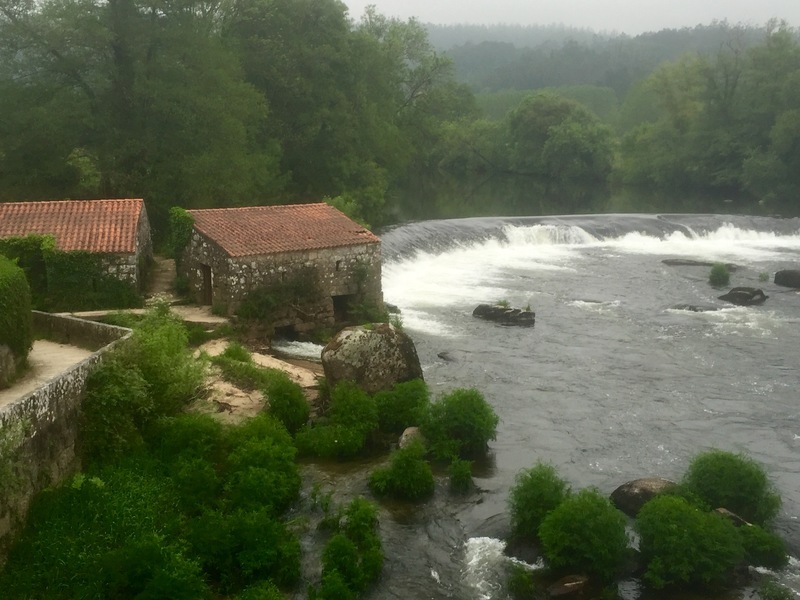 Everyone has to hike the Camino they can–starting where they are able, marshaling the support they might need or at least can afford–but the last 100 km from the east heading into Santiago are a zoo. It is not trekking, just dodging people as if you are at an urban street festival. It is a shame that people who make that trek never get a sense of the beauty and pace of the long Camino. Today, I got a memory of that beauty and pace, making the descent into Finisterre (a place jammed with peregrinos) much more pleasant. The sun held long enough to sit for an hour or so in the square in order to write this. Along with Finisterre, Muxia is one of the medieval “end of the earth” points. Looking out from the ridge, it is easy to imagine why they would take that view. The area here is the Costa de Morte, a name drawn from the hazards the rocky coast with its powerful currents, but it also brings the proper foreboding a place at the end of the world should evoke. The shore is steep with rocks randomly strewn to produce spectacular spray when pounded by ceaseless waves. On the northernmost point is a church which was nearly destroyed by waves and fire on Christmas Day a few years ago. It is now rebuilt, stones looking strong but still fragile in the face of ocean forces. The town is anything but foreboding. Set between the larger, newer concrete buildings are two-story stone fisherman’s houses. This is a place of the sea, houses low and strong, braced against the weather but turning to the sun, what little sun there is. The people strong and resilient, facing long, cold, wet winters, and springs of rain with only occasional days of sun. I arrived in Muxia with the rain, but on Tuesday, the Galician holiday, the local drum and pipe band (mostly young children playing so seriously) came out to celebrate along with the sun. They serenaded my lunch, and the sun followed me to the beach, pure white sand dampening the roar of the waves on the rocks. The day of sun here is a day of celebration, whether holiday or not. All was in alignment– weather, holiday, and calendar–as it was also my hiking partner’s birthday. Celebration all around. Muxia is a place of food– chipianas, navajas, percebas, langostinos, and of course, plate after plate of pimientos de padrones. Here you must eat well, to appreciate the labors of the fishermen and to have the strength to stand up to the weather that blasts the end of the world. 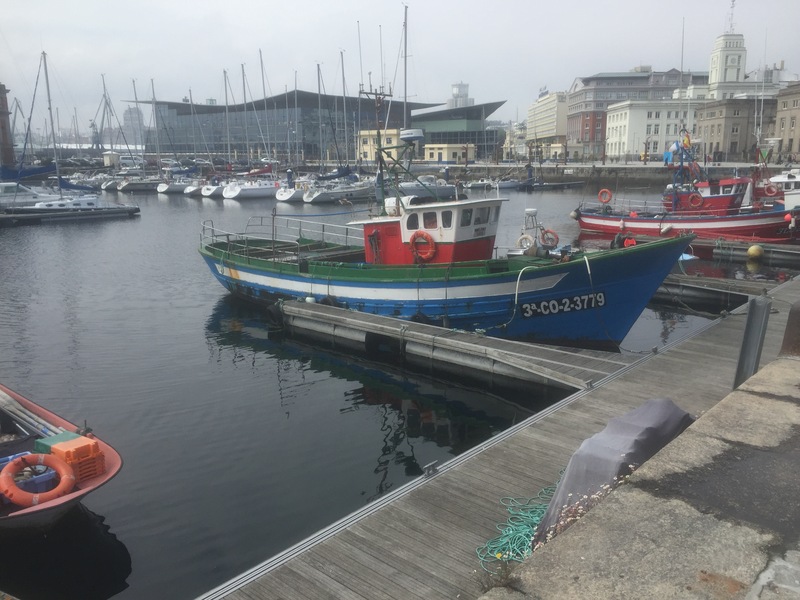 The apartment buildings along the inner harbor of A Coruna are faced completely with wooden window frames standing off the building about two feet. They collect the morning sun and heat, and from the outside look almost as if the structures are draped in lace. The sun finally made an appearance this morning just in time for coffee by the harbor and a short tour of the castle before catching a bus to Muxia. The ride was along the northwest coast of Galicia before turning south to Muxia, a fishing village on the Atlantic. The bus passed through a series of small towns on the coast, each showing their historically strategic importance with a castle and defensive structures. Muxia, like A Caruna on a smaller scale, is a long narrow town filling a peninsula. Instead of the tower of Hercules, it has a small lighthouse and a large church at the point, a place where the seas crash hard on worn, rounded rocks–a slurry of white foam and constant roar. Now fully in tourist mode, travelled by train to A Coruna, up on the Galician coast to see the ocean but also hear Guadi Galego sing. 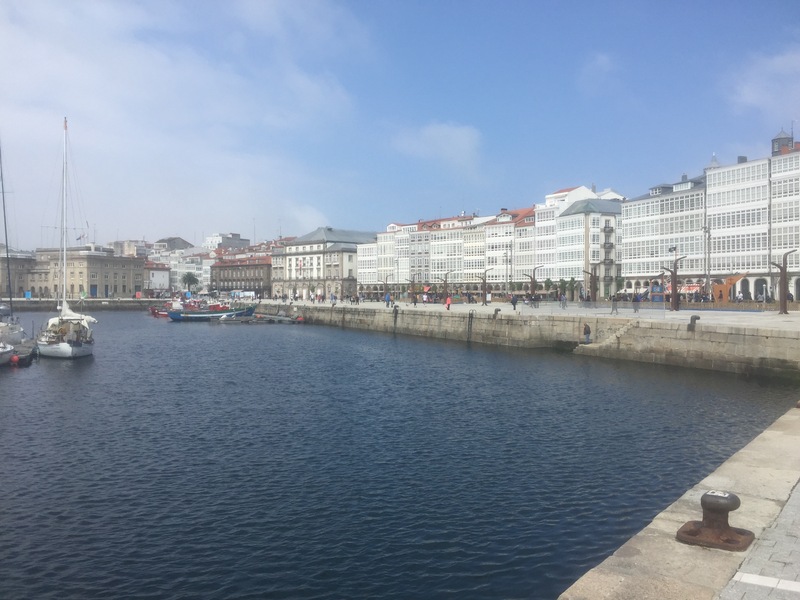 The weather continues to be Galician sunshine (a constant light rain) but there is something magical about A Coruna. A city bounded by water, a very long history, and subject to very wet weather, the people are incredible– always smiling and helpful. Seems a cliche, but just a fact. 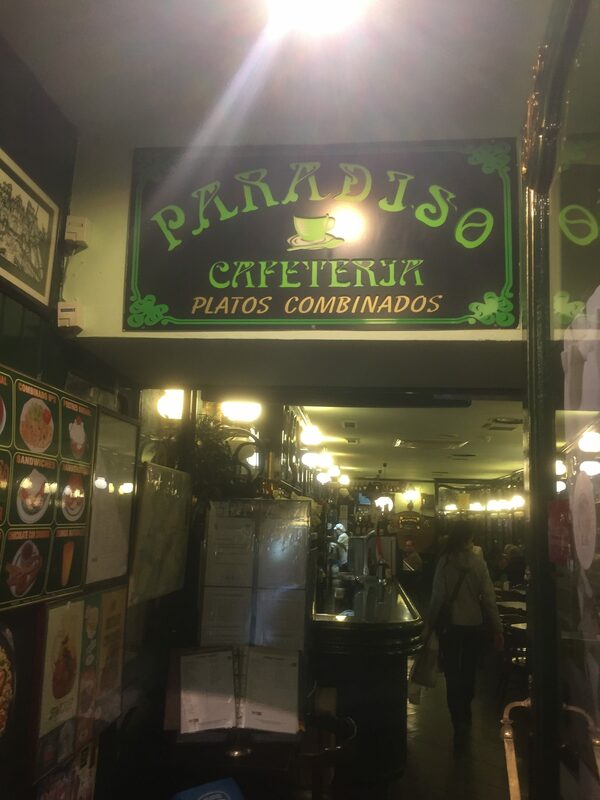 Ate twice in an amazing Jamonaria, specializing in old iberica ham (with many hanging from the ceilings) and serving amazing pimientos de padrones — grilled salted small green peppers. The tower of Hercules is an operating lighthouse with much of the same structure built by the Romans in the first century. Was eerie to climb steps and look at a structure that old. Guadi Galego and her band put on an beautiful show. All the songs were in Galician, so I definitely did not understand a word, but the music was amazing. The only mistake was in no checking the soccer schedule as Real Madrid played Coruna Saturday afternoon– would have been fun to see even if the home team lost. Crossing cultures. The end point of a trek, particularly a heavily traveled pilgrimage produces a remarkable convergence of cultures. 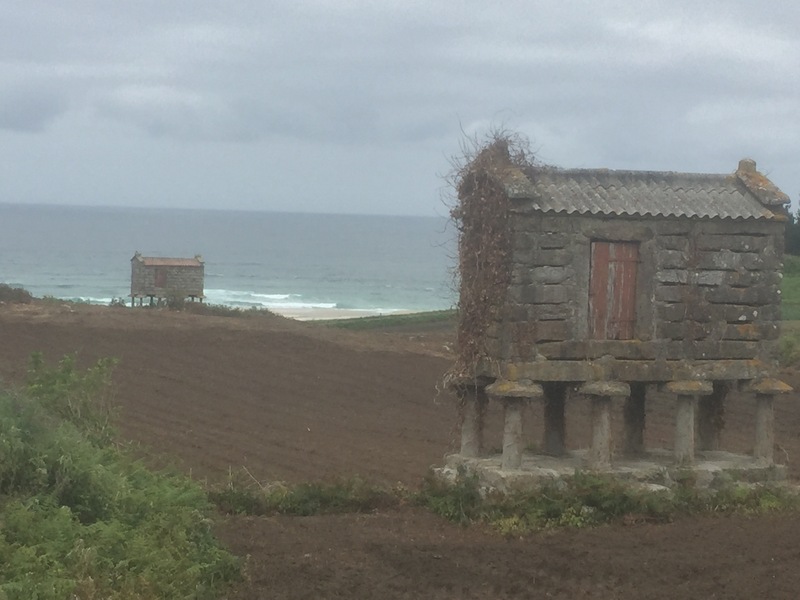 I spent much of my Camino walking with an Italian and a Portuguese, so our words veered between four languages, appetites varied, and just the simple gestures of daily life had different nuance. Santiago is a veritable Babel of voices, facial expressions, and attitudes. This evening I heard a jazz quartet joined by three singers specializing in Galician folk songs–a strange but somehow perfect crossing of musical cultures. The bass player would have been right at home in a NYC jazz club while the singers played pandeiros–square wooden frames covered with a drumskin on each side and played with a stick alternately rapping the wooden edge and the drum head–and would have been welcome in the village square centuries ago. They could coax an amazing set of sounds from such simple instruments. Like walking, the music helps glimpse an older world, one unknown and even unsuspected. End of trek redux–to not be a walker brings a strange sense of loss. Over breakfast watching peregrinos wander in, seeing them not as colleagues but as someone still trekking is unsettling. Of course I’ll be back amongst the walkers soon enough–will commence the Trans-Swiss Trail later this month and might still hike to Finisterre when the weather clears–but for now, the tourist mantle doesn’t fit well. 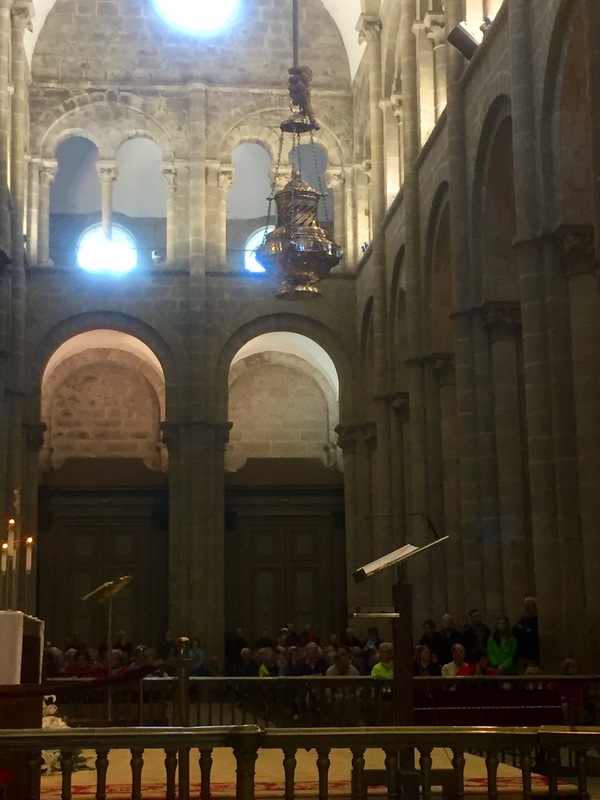 The true end of the Camino proper (not including the Finisterre extension) is the pilgrim’s mass at the cathedral. They brought out an entire phalanx of priests, and as part of the service read out the countries of origin for today’s peregrinos. Then at the end, there was the high drama of the botofumeiro–a large, heavy silver incense burner swung high by a phalanx of lay brothers. They light, lift, and then, through coordinated pulls on a rope, get the botofumeiro swinging almost to the ceiling. I was in the narrow part of the church so initially it swung up close enough to seem as if it would graze my head. The story is that in the old days (and maybe partly today) the pilgrims arrived filthy and smelly, so the botofumeiro purified the air in the cathedral, or at least helped the regular worshippers to remain. It is quite a spectacle. Spent the evening in the basement of a bar listening to Galician Gaelic music–also quite a spectacle. Former walker, now tourist. It’s hard to think through trail endings. Long anticipated and suddenly appearing, they usually drain away any words that might help make sense of a long, unfolding path. People feel elation when finishing an arduous trek which often brings a compulsion to celebrate, commemorate, and commiserate with those friends soon going back to their non-walking lives, but to think through ends requires time and solitude. 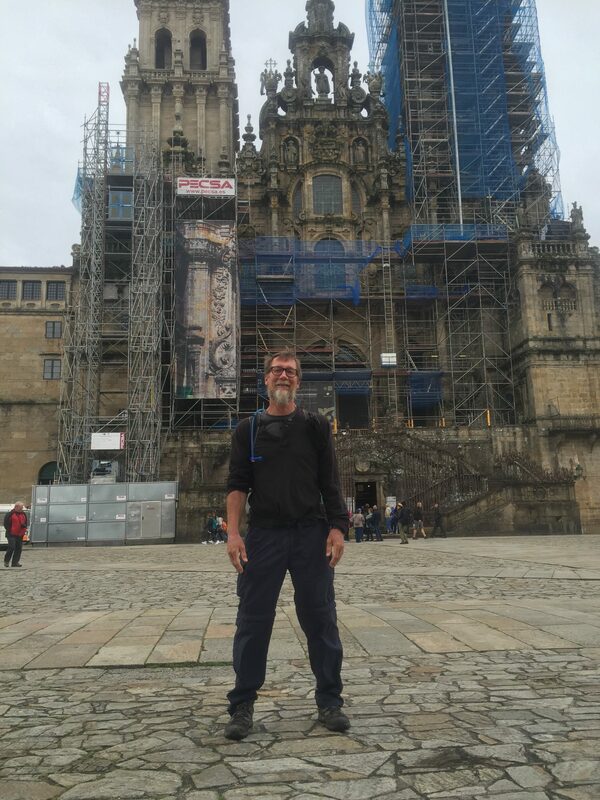 I finished the Camino de Santiago today, wandered about the square in front of the Cathedral a bit seeing acquaintances who finished recently. I then went down to get the merit badge–the compostela which testifies to my official pilgrim status. Like diplomas, certificates of completion bring little real satisfaction. Because of its status as a religious pilgrimage, the Camino calls attention to an often unthought part of the end of any trek–the importance of the sacred. I’m not talking specifically about the artifacts here–St. James’s remains–or the Cathedral in all its splendor. Instead I am thinking of how a sense of the sacred serves the walker, how it forms a sense of ending. Entering the city I passed a man, an older peregrino, who beamed, telling me there were dos kilometers left. The back of his neck was deeply furrowed along with a finer cross-hatching of wrinkles. His was the neck of a farmer, someone who had toiled long and hard years in the sun. I imagined that he, like peregrinos from centuries past, had planned in his declining years to make this trip, the pilgrimage of a lifetime. His joy was scarcely contained as he held up a finger and a thumb, signaling the near completion of his walk. Soon he would be embracing St. James. I spent the second half of my Camino walking with a devout Catholic. She was not making the single pilgrimage of her lifetime–she had already walked the Camino Portuguese–but her Camino was an embrace of the calm and peace of sacred spaces. We stopped at tiny, ancient churches. Often I would get caught up in some architectural detail–an interesting framing plan for the roof, some carved ancient wood, or the workings of an old clock–but even I felt the spirit of the place. My feeling for the sacred did not come from religious belief but instead grew from the church’s very design. Exuding both time and timelessness, these places lift visitors out of the hum and buzz of the quotidian into another place. Martin Heidegger writes about “the clearing,” first calling up the space opened by woodchoppers cutting timber, but then, by extension, the possible clearing of thought, to arrive at what had been the unthought. Clearing also is the act of clarification, the cleansing of the doors of perception. To me, Heidegger’s clearing is the encounter with a secular sacred, something walkers of all beliefs and non-beliefs regularly experience. Usually up before dawn, we see the sun rising in a long black distance. Following an ancient footpath, we encounter a turn, a slow sweep of the way, perhaps lined by ancient oaks covered in green mats of moss, vines, decorated at their base with columbine, violets, daisies. A spring flows beneath a gnarled tree-trunk. The path leads into a dark, intensely silent forest. In those moments, quotidian care, the triviality of routine, thought-destroying bureaucracy (periodic peer review), diminish to the nothingness that they are. The walker’s sacred is lived in those clearings. The Santiago de Compostela Cathedral is a religious space marking the end of a long pilgrimage. Ends have purpose, signal accomplishment, sometimes define self, but a walker’s sacred is lived in the clearings along the way.